From G.G. Sivjee and C.S. Deehr's presentations at the 32nd AM in Longyearbyen, 2003. All photos at the courtesy of C.S. Deehr. The history of optical measurements of aurora at Svalbard goes way back. The first instrumental measurements were made during the first polar year 1882/83 at Kapp Thordsen, on the northern side of Isfjorden. A Norwegian - Canadian expedition lead by Profs. 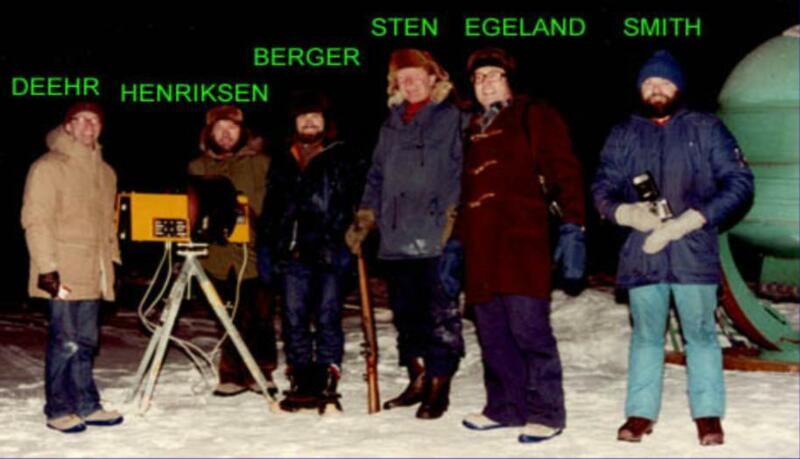 Tom Berkey and Ove Harang was conducted in 1975 to map optical signatures of the dayside aurora from Ny-Ålesund. However, the first permanent optical observatory was not established until 1978. 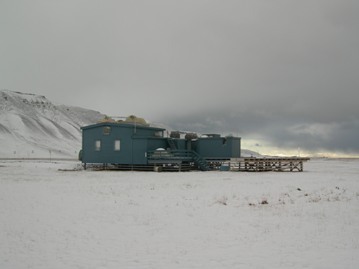 The plan for such an observatory started off when Professor Kjell Henriksen spent his sabbatical leave from the University of Tromsø at the Geophysical Institute at the University of Alaska, Fairbanks, in the mid 70's. There he met Drs. Abbas Sivjee and Chuck Deehr who were looking for a location where they could do F-region mid-day cusp auroral research. Sivjee submitted several proposals for research grants and finally in 1977 the National Science Foundation (NSF) funded at a modest level one of his proposals. 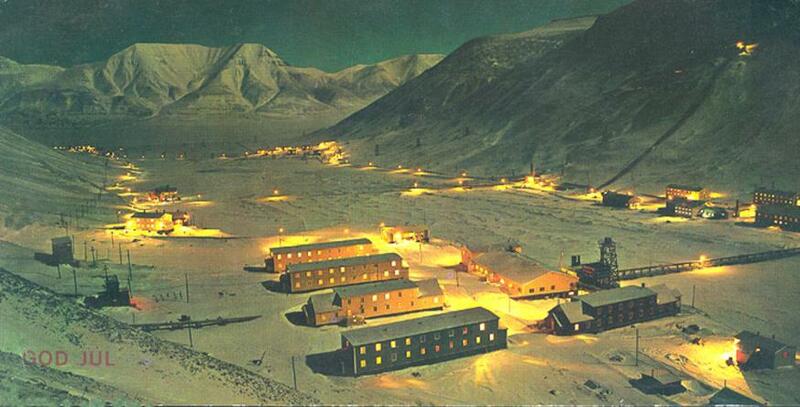 Chuck Deehr managed to arrange transportation of the huge electro-optical facility, housed in a second world war anti-aircraft gun searchlight system, as well as a complete Quonset hut, to Svalbard. The searchlight and other equipment being unloaded from the Hercules airplane in Tromsø, summer 1978. Deehr, Henriksen and Sivjee talks about the new station to the Tromsø newspaper Nordlys. 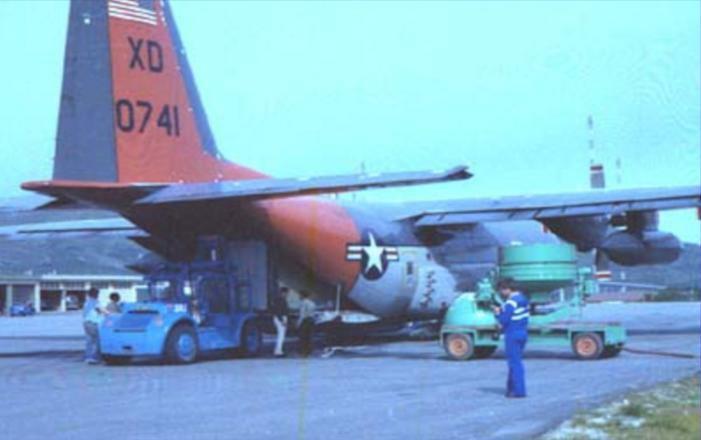 During the summer of 1978 the NSF C130 Hercules, normally used to supply NSF's Antarctic stations, flew the equipment to Norway as part of the summer flight training of the C130 crew. However, in 1978 the world was still in the cold war era and there were concerns that a US Herc landing on the de-militarized Svalbard, would lead to troubles with the Russians. 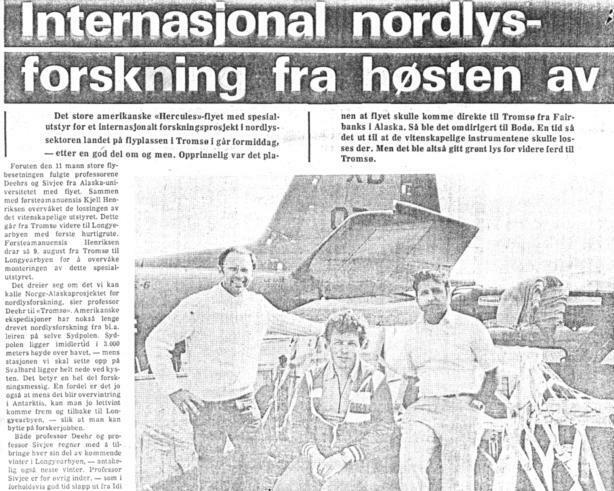 Instead the airplane flew to Tromsø, where it and its mission gathered a lot of attention in local media. 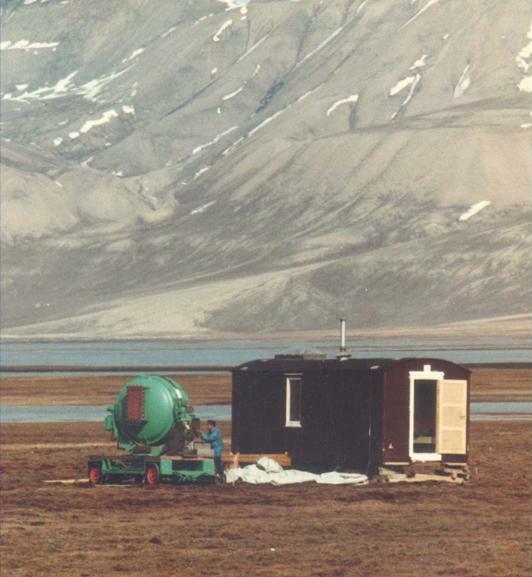 Kjell Henriksen arranged for unloading, safe storage and marine transportation to Longyearbyen, Svalbard, and also located an excess trailer to house the research facilities in Longyearbyen. 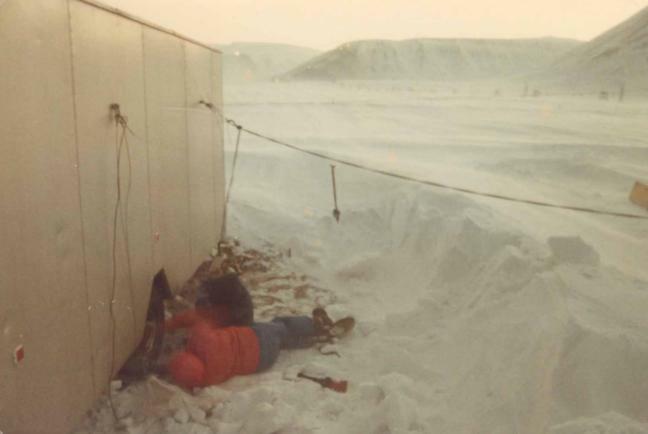 In the last week of September 1978 Kjell Henriksen and Abbas Sivjee arrived in Longyearbyen to set up the facilities in Endalen, not to far from Vinkelstasjonen (the cable car central). The spectrophotometer, the searchlight pointing system and the meridian scanning multi-channel photometer were assembled, and everything worked fine except for the computer control of the spectrometer and its data logger that had suffered some beating on the way from Alaska. 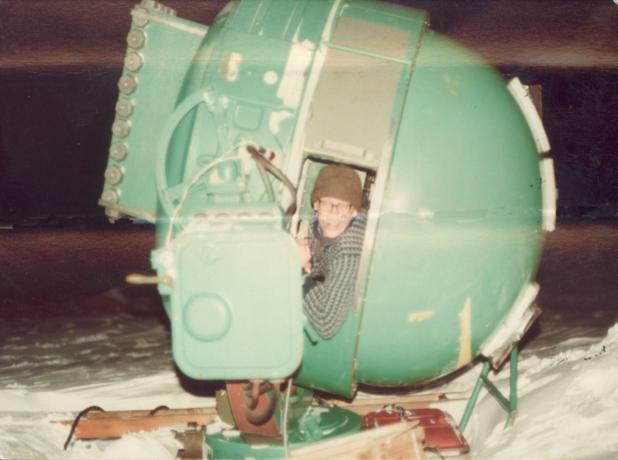 During the same summer, Roger Smith and his students from the faculty of the poly technical institution in Belfast, Northern Ireland, worked hard to establish the FPI (Fabry-Perot Interferometer) trailer as a part of the observatory grouping beween Vinkelstasjonen and the airport. Abbas Sivjee stayed in Longyearbyen during the autumn repairing the equipment and in late October he finally got the system going, and he could lapse in the joy of measuring the spectra of the high altitude F-region emissions from the mid-day cusp aurora. Another problem arising during the first winter, was keeping the instruments at a reasonably warm temperature, but without overheating them. Car heaters with a thermostat did that job, but in a storm period the thermal control was lost during a power surge. Due to the weather, it took several days for Abbas to go out there to check on the conditions. He then found a very hot searchlight housing and severe degradation in the signal levels from the spectrophotometers due to the formation of a thin coating on the gratings. By the help of friendly Store Norske carpentry and machine shops, special holders were built to ship the delicate and fragile gratings to Bausch and Lomb in NY for removal of the coating. In town the scientists lived and ate with the regular miners in the miners' quarters. The transportation to the station was provided by the coal company via the miners' shift bus to and from mines #6 and #7. After several weeks the gratings came back and the instrument was back in business. After Christmas, Chuck Deehr came to relieve Abbas Sivjee and from then on, the cusp investigations in Longyearbyen matured to a very smooth operation. 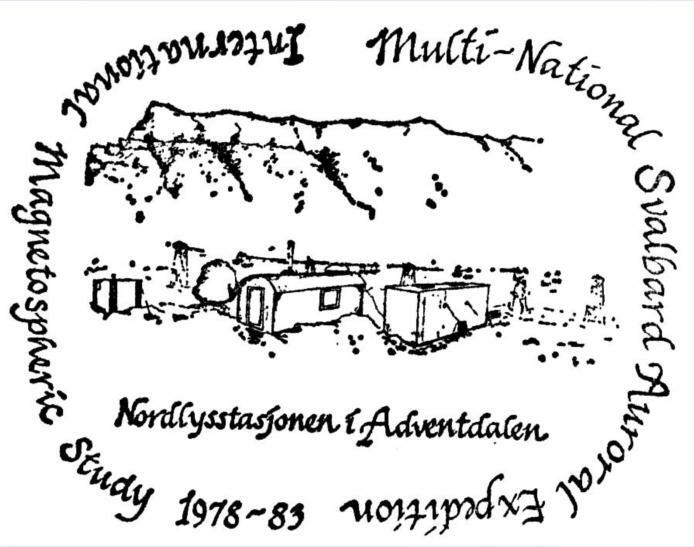 In January 1979 several scientist from Norway, Alaska and Ireland arrived to carry out a campaign they called The Multi-National Svalbard Auroral Expedition. Kjell Henriksen commissioned Karen Lundberg to draw the station and make a stamp to issue to philatelists the world over, earning money for the new station. View of Longyearbyen and the miner's quarters. Charles Deehr keeping warm inside the searchlight. In 1983 with the help of Kjell Henriksens tireless energy the workspace was upgraded from a temporary trailer near Vinkelstasjonen to a permanent building with much more extensive physical facilities. The old site was too close to the drinking water drainage and the new Auroral Station was built at the site of the old airport runway in 1983, right across the road from Vinkelstasjonen. In 1988 the need for even more space led to an extension being built. The latest extension to the station was an outdoor platform built in 2002 to hold the french EPIS interferometer trailer. Since the Auroral Station in Adventdalen was built in 1978 it worked as an optical site for ground-based observations of the dayside and nightside aurora. Refereed scientific literature bears testimony to hundreds of publications on cusp auroral investigations at this station. The three main architects behind the success is clearly Abbas Sivjee, Chuck Deehr and Kjell Henriksen. They themselves acknowledge several other people as important contributors, these include Alv Egeland, Herb Carlson, Danny Winningham, Ben Fogle, Alv Orheim, Jerry Romick, Bob Spies, Steve Geller, Howard Birch and Denny. At the last season it was used (2006-2007) there were more than 15 different optical instruments employed at the station as well as several non-optical instruments. In the 1990's a new generation of young auroral scientists dedicated to The Auroral Station was trained. Two of these, Fred Sigernes and Dag Lorentzen currently professors at the University Centre in Svalbard (UNIS), worked to have the Norwegian government fund the building of a new and bigger station. The old one was quite crowded and had minimal room for new instruments, and there were additional troubles because of increased light pollution, sand storms, traffic etc. 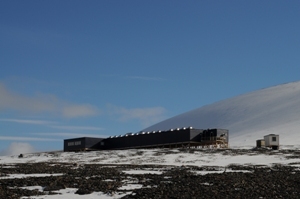 The work finally paid off and in May 2005 the funding was in place and the new observatory is now located at Breinosa, above the EISCAT radar antennas, at the Gruve7 mountain. After being through the official planning process the building process started in January 2007, and was officially handed over in September/October 2007. The name of the new station is Kjell Henriksen Observatory (KHO), dedicated to the late professor who put down a lot of work and soul in the "old" Auroral Station. Currently there are 25 optical instruments and several radio instruments (10x) located at KHO. The observatory and its staff are participating in rocket campaigns and other auroral campaigns. Kjell Henriksen Observatory (KHO) August 2008.